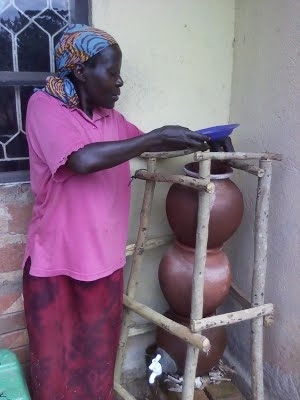 SODIS technology is apparently used for purification of drinking water among the rural poor communities of Uganda. Evidence of technology application is at the water school in Kisoro. If well administered, the technology could provide a remedy for enhancing the safety of drinking water without reliance on wood fuel, expensive electricity and gas. Though used in some parts, the technology has remained unknown in most parts of the country. Besides, there is scanty information on its effectiveness. The available data is basically studies from outside Uganda and their findings are double fold. For example, studies in Kenya indicated potential for SODIS to reduce prevalence of water related diseases (Graf et al, 2008 & Conroy et al, 2001). The health impact study carried out on 7 treatment communities and 4 control communities for a period of one year indicated that in Bolivia illness such as diarrhea did not drop despite the wide adoption of SODIS. The observed failures of SODIS technology in other countries cannot be taken binding for Uganda. The causes of failure are not explicitly indicated and this gives room for speculations. There are a number of factors that can compromise the effectiveness of SODIS technology. For example, it cannot be effective with rain. During rains, even if bottles are put out for disinfection for a full day, the process cannot be completed due to absence of the sun. Old, scratched, blind and colored bottles are not advised to be used for solar disinfection because of their low UV-transmittance. Despite the adaptation of SODIS technology in some parts, there is hardly any evidence documented to support promotion of the technology in Uganda. ATC is thus undertaking a study to generate laboratory based evidence of the potential of this home-based water treatment method to purify water for drinking.